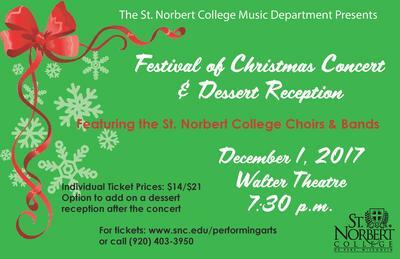 This is St. Norbert's annual Festival of Christmas Concert, held in the Walter Theatre located at the Abbot Pennings Hall of Fine Arts. This concert celebrates the Christmas season with carols sung with the audience and an assortment of holiday themed performances by the college's ensembles. St. Norbert College Music Department, "Festival of Christmas Concert" (2017). Music Performances. 41.